Welcome to the Rowell Sugarhouse! Because our nearly 500 acre farm has a lot of maple trees, we are able to carry on making maple syrup in the tradition of both Norbert's family and Gloria's family, the Berards in Danville. At the Rowell Sugarhouse, you’ll not only tour a real Vermont maple sugarhouse and see the equipment used to produce our delicious maple syrup and products, you’ll also peruse the paintings and prints of local artist, Gloria Rowell, as well as Vermont handcrafted wood turned bowls, quilts and quilted crafts, jams & jellies, and Vermont cheeses. We also carry antiques, t-shirts, deerskins, lamb’s wool, moose and deer sheds, baskets and collectibles and much more - at very reasonable prices! We tap our own trees and boil the maple sugar water down to syrup. Nothing is added! It takes an average of 40 gallons of sap to make 1 gallon of syrup. 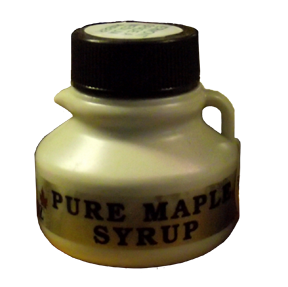 We package our syrup in a variety of containers, from very tiny up to one gallon. We also make our own candy and maple creme. Besides seeing our stainless steel equipment we use every year, on display is our exhibit of very old maple sugaring collectibles. The Rowell Sugarhouse is owned by Norbert and Gloria Rowell. Both Norbert and Gloria's families have been maple sugarmakers for generations. Our son David is fully involved in sugaring and our other 3 children Sue, Lloyd & Sheila help out when needed. We are located in Walden, Vermont, just 5 miles from The Cabot Creamery in Cabot, VT and 5 miles from Joe's Pond. in Danville, VT.
Our Gallery & Shop are open yearround, every day from 9am till 5pm. Vermont is a modest state, but it is the largest producer of pure maple syrup in the country. 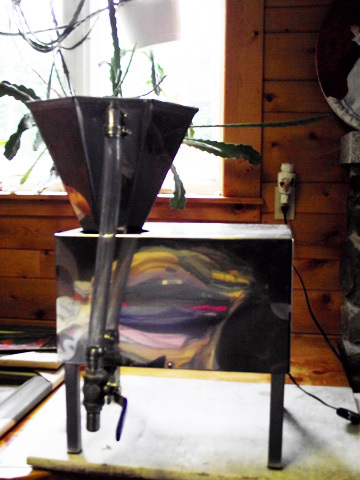 Sugaring is a special art handed down from generation to generation. Vermonters take great pride in their syrup, always striving to keep Vermont's reputation of producing the very best flavored maple syrup there is. 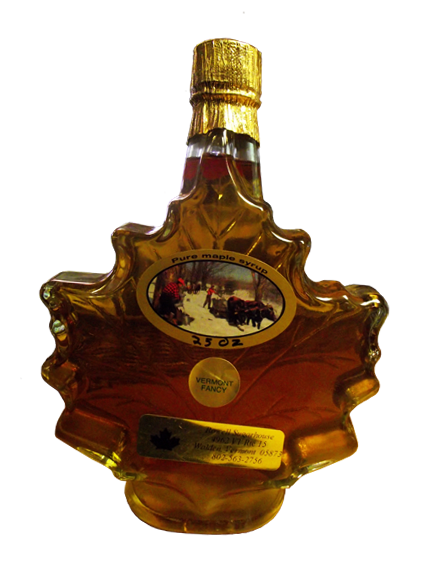 Made solely from the sap of sugar maples, pure maple syrup is just that, made without preservatives or additives. The Rowell sugaring forest consists of over 3000 sugar maples. Sometime during March, when winter's cold gives way to spring thaws, we put on our snowshoes and drill new tap holes into the maple trees. During sugaring season each tap hole may produce up to 10 gallons of sap or about 1 quart of finished syrup. It takes about 40 gallons of maple sap to produce just one gallon of pure maple syrup. Maple creme is made from pure maple syrup that is boiled to a higher temperature, then quickly cooled and stirred to a creamy consistancy. For large quantities, we have a machine so I don't have to stir all day long. To the right is a photo a maple creme machine, on display, at The Rowell Sugarhouse. 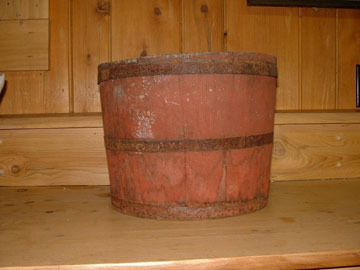 When the colonists started sugaring they used wooden buckets and wooden spouts to collect maple sap. They boiled it down in big iron kettles. Maple sap was, at that time, boiled down and stirred to sugar and then stored. Many improvements have been made, but the goal is the same. We must get water out of the sap to make a pure maple syrup that can be stored and enjoyed! Yummy! Sugaring season only lasts about 6 weeks but visitors are welcome to visit our sugarhouse year round. Wood Turning is an art adored by wood craftsmen, here, in Vermont and a great way to make useful and beautiful items from our own wood! Done with a lathe, hardwood is sculpted into a variety of usable items, such as, bowls, platters and other artistic renderings of useful housewares. Wood turned bowls at the Rowell Sugarhouse are made from sugar maple, white birch and oak. 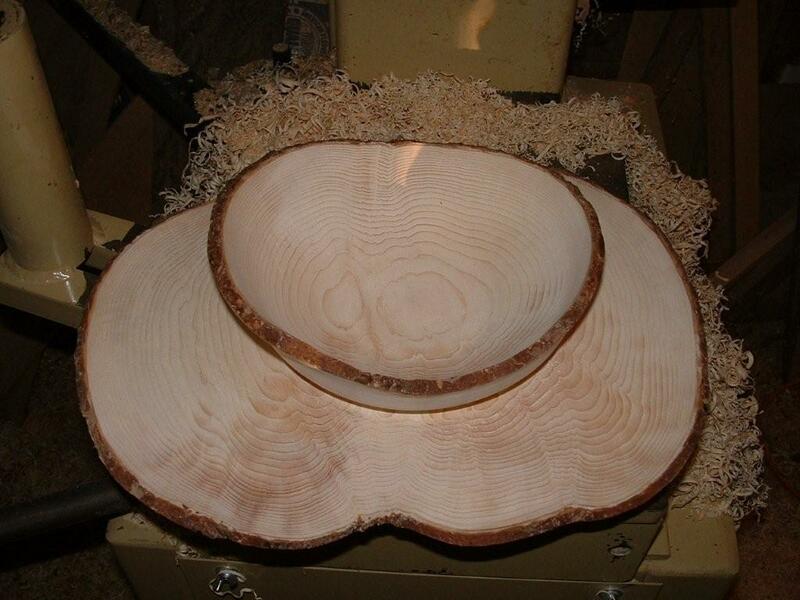 To the right, white birch has been fashioned into a bowl and matching platter. Note the imperfection in the symmetry of the design. The pieces were sculpted to purposely display the natural beauty found in its donor. In this way, we keep the gentle curvatures that grew over decades. Another piece made from sugar maple, (photo, left), displays a number of imperfections that add tremendously to the overall composition and design. The impressions tell a story. One can easily distinguish dark crevices that were likely impressions left by its unwitting demise. At the Rowell Sugarhouse, sugar maples are utilized as producers of their sap for maple syrup. This poor maple had fallen victim to the elements and is now preserved by way of the art of wood turning. Sometimes trees fall or need to be cut. Norbert saves choice pieces for me to turn on my lathe. After many hours, I can produce a bowl, vase, goblet, etc. 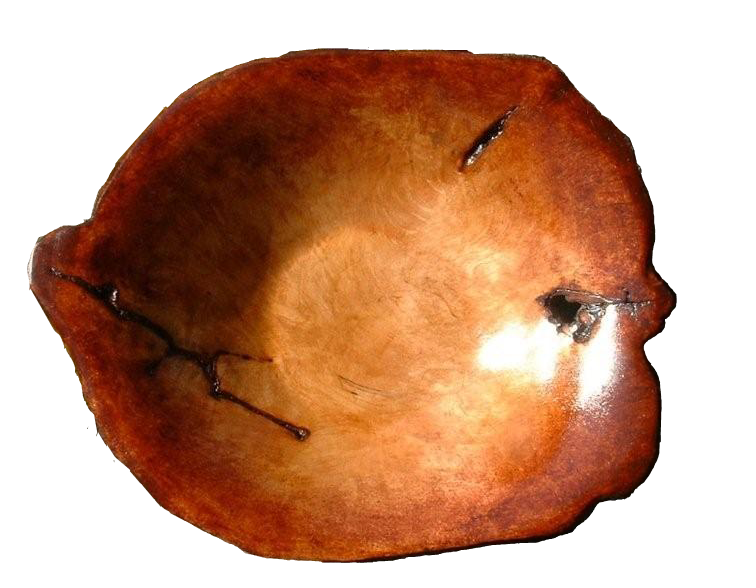 Burls add an especially unique quality and texture to wood. I like to keep the natural edge of the wood which makes each piece one of a kind. Local craftsmen also bring their handiwork for us to sell at the sugarhouse. 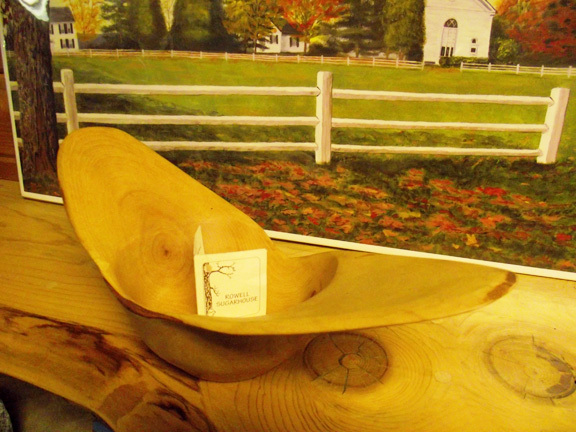 Whether it's a tray, cutting board, a small piece of furniture, "Made in Vermont" insures that it is special. At the Rowell Sugarhouse, you'll find a number of wood turned bowls to choose from, each unique in many ways. The bowl, above, is a one of a kind. The Rowell Sugarhouse is home to a number of prints and paintings by Gloria Rowell. Vermont country life has provided an abundance of charming scenes and scenery to grace the canvas' of many local artists. 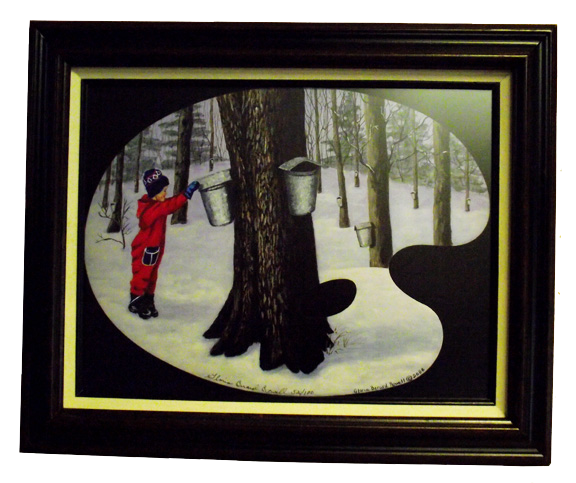 Local artist, Gloria Rowell, displays her rendition of Vermont country life and Vermont maple sugaring through her various works. To the right is an interpretation of maple sugaring. The painting is highlighted by its artist's pallet vignette, adding to its grace and charm. Gloria Rowell has been selling her artwork since the 1980's. 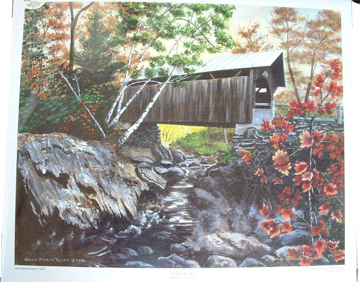 "Vermont is always beautiful and changes so much with each season that I am always faced with something I want to paint. I have also been so fortunate to have many requests to do commissioned paintings. I have several signed and numbered prints for sale at the sugarhouse." Gloria Rowell. You might find Gloria painting as you enter the Rowell Sugarhouse. 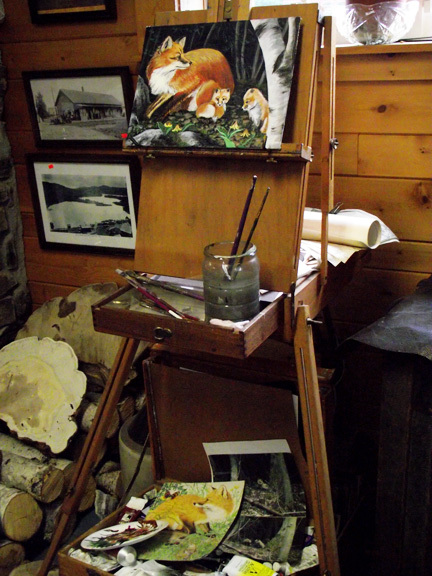 She keeps her easel next to the woodstove in the showroom, with her brushes and paints waiting for her inspiration. Her current work in progress is of a red fox with its young among the white birch. Her works are on display and for sale to the general public at the Rowell Sugarhouse. Prints are also available. 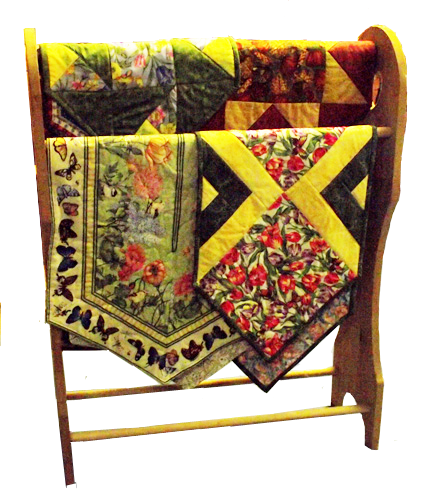 Handcrafted quilts add country charm to virtually any decor. The Rowell Sugarhouse has in its shop an assortment of quilted pillows, table covers, handmade pocketbooks, tote bags and odds and ends in a variety of colors and patterns. Local ladies enjoy making beautiful things in the comfort of their own homes with their sewing machines. At The Rowell Sugarhouse you might find a little bit of just about everything. 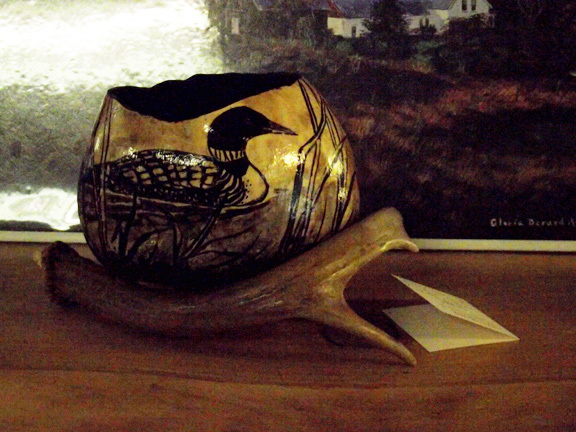 To the right is a hand painted gourd nestled on top a deer antler. The detail and finishing make it an unusually striking piece. The artist, Gloria Rowell, brings her artists brush to mother nature's canvas with her interpretation of Loon amidst reeds. The outlines are dark and simplify the scene. The background is a polished wood tone, similar to birch. 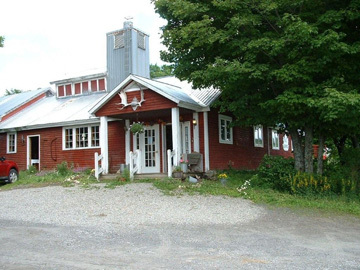 The Rowell Sugarhouse is located in Walden, VT, just five miles from the Cabot Creamery in Cabot, VT and five miles from Joe's Pond in Danville, VT. We are open year round, seven days a week, 9am till 5pm. We're not too difficult to find. From VT Route 2, take Route 15 in West Danville to Walden, VT. We are about 5 miles down on the right. If you are coming from the Cabot Creamery, head Northeast on Main Street, VT Route 215 toward Elm Street until you reach VT Route 15. Take a right onto Route 15. We are a few miles on the left. If you are coming from Hardwick go east on Route 15 about 5 miles. You'll find us on the left. Interested in contacting us? Please feel free to send us your email. We would be happy to hear from you.Email Us. 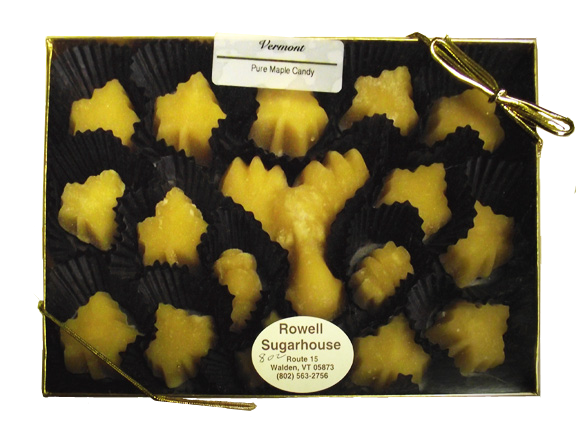 The Rowell Sugarhouse, 4962 VT Route 15, Walden, VT 05873, 802-563-2756.